But back to my tartare—it’s a dish that I order at every trustworthy restaurant I visit and it is always more or less the same everywhere: a pile of chopped or ground raw meat, egg yolk gently placed on top, with the rest of the ingredients on the side, so that the customer can mix everything together, leaving some out (or not). Well, at least I thought it couldn’t be served differently. But about two years ago I asked for a tartare in one of the best (in my opinion) restaurants in town. The chef brought over a little cart and prepared the steak in front of me. I was impressed by how thinly he chopped the meat. But the most important thing was that he mixed all of the ingredients himself and served the tartare in tiny portions formed with two tablespoons. You might think that this would take away the fun of doing it all on your plate, and you may be right, but the truth is, you will never be able to mix everything as perfectly on a plate without making an unappetizing mess. Also, I loved how he seasoned it for me — it was perfect. And there was nothing left for me to do but enjoy. Ever since that day, this is how I prepare my tartare. Remember that the key to this dish lies in the quality of the ingredients! Remember to chop all the ingredients very thinly! Place all the ingredients in a bowl and mix thoroughly. 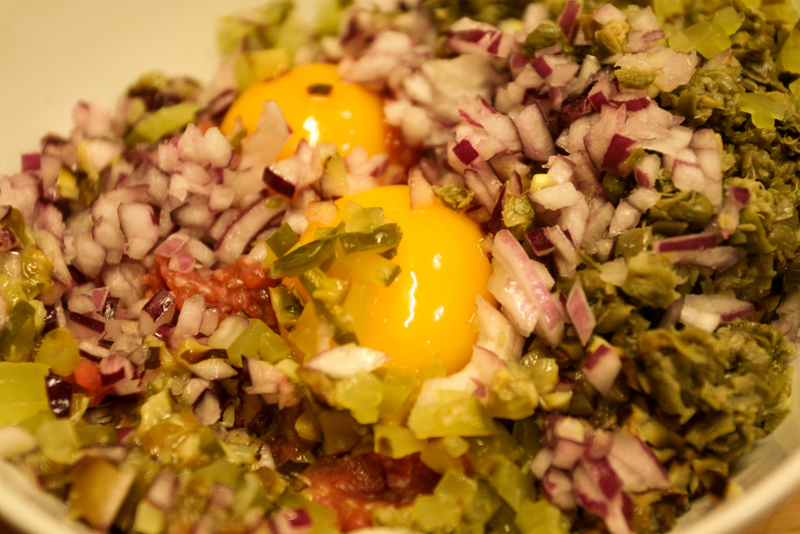 Using two spoons, form little egg-shaped portions and serve.